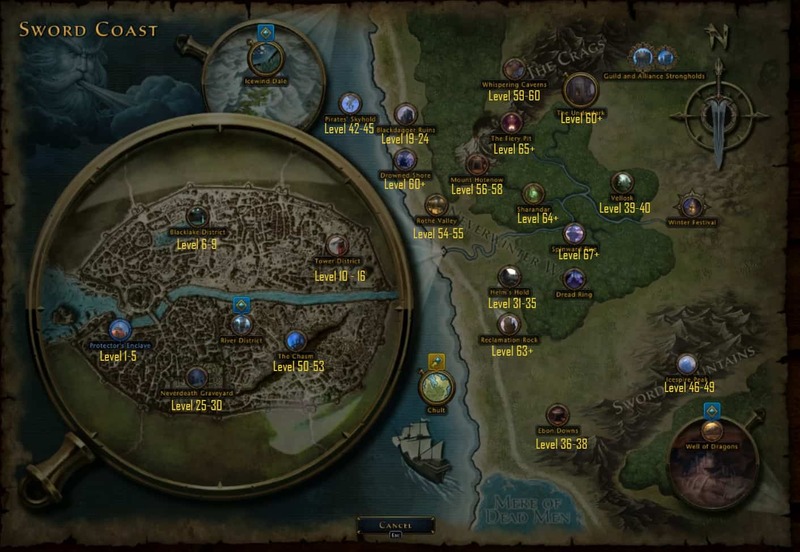 Neverwinter Leveling Guide - Level from 1 to 70 as fast as possible! Before we start with the actual Neverwinter Leveling Guide we will go over some general leveling tips. Have some of the items listed below will make your leveling go a lot quicker, but you are going to need some AD. If you need help making AD, check out our Astral Diamond Guide. Put Azure Enchantments in every utility slot you have for bonus XP gain. Get atleast rank 5, these only cost around 200AD and boost your XP gain by 7.5% each. I usually go with the rank 7’s, at rank 8 they become a lot more expensive. Mounts increase runspeed which helps with leveling speed, but you can also get Insignias of Prosperity from the Auction House that you can equip to your mount that give bonus XP. You will want mounts with regal, enlightened and universal slots, and slot the with Prosperity Insignias. You can get cheaps mounts for gold or on the AH, or from events. Inscribed Garments can be purchased from the Zen Market and will give you 20% extra XP. Ensorcelled Items and other scaling can be bought on the AH. This is powerful equipment that scales with your level and can be used at any level! A full list of scaling gear can be found here. I am usually not bothered with much gear as levelling is so fast anyway. Get a companion at level 16. Companions are a really important aspect of Neverwinter. Companions come in different types like Healers, DPS and Tanks. Get one that complements your class and playstyle and they will really help you out. If you can, get a epic quality companion for the toon that you are levelling. I usually get the Redcap companion as it is a cheap epic quality striker that will help you plow through content. You can give your Companions high level gear that will make them a lot more powerful. Bagspace: If you can get some bags, this will help you out a lot. The more room you have in your inventory the better. Invoke to the gods (after level 11). Pressing CTRL + I next to an Altar (found in Neverwinter or as drops from mobs) will have your character pray. You will get stat boost, potions etc, and you will get XP. Quite a lot of XP acutally, so pray as often as you can. Experience Booster and Epic Experience Booster from the Zen Market. If you have Zen or is willing to buy Zen i would recommend that you buy an Epic Experience Booster. You will get 2x XP all the way up to level 70 and will level twice as fast. These are also rewards from events sometimes, like the Winter festival. Double XP events happen quite often and it can be wise to leave leveling alts to these periods. Check the calendar in game to see when the next XP weekend is! Being a VIP member will give you 10% extra XP. Most guilds have the Experience Bonus Boon available, so join a guild to get a 3-30% XP bonus. If you already have a character at level 70 you will notice that you sometimes get Tomes of Experience from the overflow experience reward, these can be used by alts to level up very quickly. TIP: If you run out of quests in any of the zones listed below, and you are still too low level to progress to the next. Either return to Sergeant Knox to see if he has quests for you, or simply run a skirmish or dungeon. For the first 5 levels, follow the tutorial and then a few quests from Sergeant Knox in Protector’s Enclave. Until level 12, questing is really the only option. So after doing Sergeant Knox a few favours, you are sent to Blacklake District. Finish the quests here and you will be around level 9. Continue to the Tower District, and get to level 12. This is when you can start doing Random Dungeons and Random Skirmishes. These are really fast for levelling, and can be used to level to 70. A mix of dungeons, skirmishes, questing and other content is generally recommended. One Random Dungeon and one Random Skirmish will take you from 12 – 17+ , if you have a booster active or during a 2x XP weekend, in about 15 minutes. If you want to continue to level by questing, see the map below for what zones to go to. It’s all pretty straight forward so I won’t go into detail about questing in every zone. Either hit up random dungeons / skirmishes, or the level appropriate zone and get to level 20. Be sure to start the Acquistions Incorporated campaign at level 15. At this point it is time to get a guild if you don’t already have one. Press the G button to browse for guilds and send an officer a message that you want to join or go to Protector’s Enclave, and say in the /zone chat that you are looking for one and you will have no trouble finding a guild. When you’ve gotten a guild go the guild stronghold, and finish the short introductory quest from The Steward. This will enable you to get the dailies from the NPC’s around the Stronghold. They are all worth doing but the main three ones that you want to do every day while you are levelling are the quests from the Cleric. These will provide you with massive (several levels) of XP, in addition to what you are already getting from doing Random Skirmishes and Dungeons in the first place. At level 20, the skirmish Illusionist’s Gambit will also unlock, and you will find yourself running it a lot if you are wanting to level quickly. I still recommend queuing for a random skirmish, but most of the time it will be this one anyway, since people running it way more than the other skirmishes. The reason this one is better for levelling is that as opposed to the other skirmishes that you can run at lower levels, it has tiered rewards (fail, bronze, silver and gold). Most of the time you want to achieve bronze and then vote to leave. The XP reward for bronze rewards you with much higher XP than from any other Skirmish. If you want you can also queue up for Illusionist’s Gambit solo, by using the Private Queue, then die and fail the Skirmish on purpose and still get a nice amount of XP. This only works a few times in a row though, but will reward you with a few quick levels. The fastest way to reach level 60 is to do a combination of Random Skirmishes, Dungeons and Quests. I generally run mostly Random Skirmishes, and fill in the wait time with a few quests here and there. At level 60, the Maze Engine and Elemental Evil modules will unlock, and you can start working on these. After completing these, continue working on Elemental Evil / The Maze Engine or run Random Skirmishes / Dungeons. At level 64, the Fury of the Feywild module becomes available. Get the quests “To the Farthest Forest” from Sergeant Knox and complete it. This will unlock Sharandar and the Skirmish “Master of the Hunt”. If you don’t do this, you will not be able to run random Skirmishes. You will find that about half the Random Skirmishes from now will be Master of the Hunt and half will be Illusionist’s Gambit. These are both great XP, and will get you to level 70 fast. At level 69 with about 60% bonus XP from Azure’s and Insignias I was getting an even 20% from each of them. Most of the time you will run “Master of the Hunt” with level 70’s that will plow through the Skirmish in about 3 minutes. And that’s it! Congratz on reaching level 70! If you are unsure on what to do at level 70, you can check out our Gearing Up Guide and our Campaign Completion Guide! If you have any questions or suggestions for our Neverwinter Leveling Guide, please leave a comment! just the guide i was looking for. Thanks mate! Does this guides order insure I get to finish every quest? Hi there, I’m looking to get in touch with Daneril. If you can see my email as the poster of this piece, please drop me a line. If not, please post here in the comments and I’ll share my details. I know this guide isn’t meant to be followed exactly, but I tend to do almost every quest I can get, so I tend to be higher level than what you mention for the areas. So, is it bad if I skip an area? Also, if you can, can you tell me any gear guides that are good? I tend to get stuck with lower level gear and wish to fix this. i couldn´t find any of the quets u mentioned in drowned shore? you did forget to tell people in your guide that they can do daily in stronghold those quests give a massive xp gain. kill 50 creatures in the questzone where you leveling xomplete a dungeon for 80.000xp at lvl 50 means level up etc.